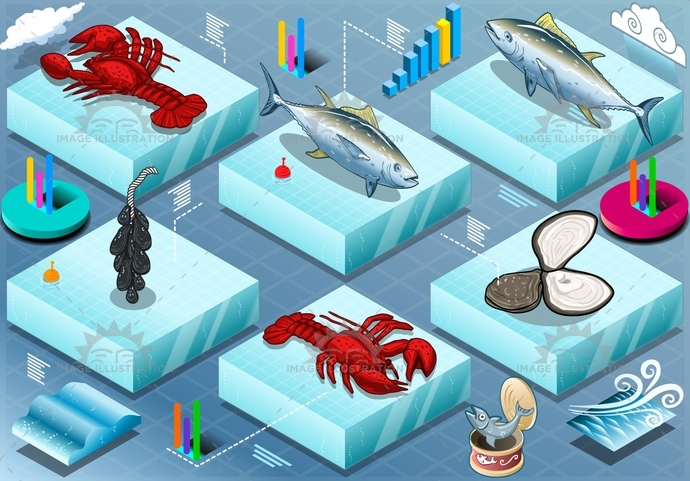 Stock product - detailed vector illustration - Isometric Tiles Collection - Fishes 02 - created by Aurielaki. Image formats EPS AI JPG. Isometric Infographic of Marine Life . SKU: Fishes-02-Tiles-Isometric-AurielAki. Category: Food Infographic. Tags: aquaculture, blue, business, cloudy, color, commercial, farm, farming, fish, fishfarm, fishing, food, fresh, industry, infographic, isolated, isometric, lobster, marine, mussel, nature, oyster, production, sea, seafood, tuna, water, wave, wind.